This entry was posted on October 1, 2011 at 8:45 am and is filed under co-ordinates, Nancy Nix-Rice, wardrobe planning. You can subscribe via RSS 2.0 feed to this post's comments. Both comments and pings are currently closed. Hi! I don’t think I ever commented but I’ve been reading your articles for a long time. I was especially interested in your articles about the Eileen Fisher system, which I find very inspiring. To me Nancy Nix Rice’s aesthetic lacks flavor. The way she blends your hair color with your skin color and makes a series of outfits out of it would just make you disappear. Do you read Tom & Lorenzo’s website? They say a woman should never wear a dress the color of her hair. So, to answer your question, I prefer some variety in my wardrobe. I think wardrobe planning is important, because if I’m going to put in the time and effort to sew my own clothes, I want to be sure I’ll get a lot of wear out of them. However, If I see a fabric or a pattern I like, I’ll go ahead and sew something, then I’ll work out an outfit or several outfits around it. One feature I find very inspiring on Eileen Fisher’s website is the “construct /deconstruct an outfit” section. 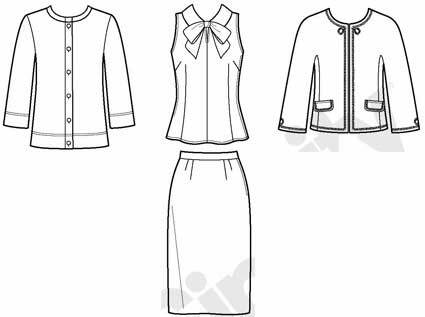 Here’s how I think it can apply to home sewers : start with a base layer (in my case, a cami dress, or a top and pants) then add 1 or 2 mid-layers ( a loose top, a cardigan, a tunic, a skirt) and finally, in winter, an outer layer (coat). Of course, alI the items I sew will eventually work their way into different outfits I construct, so hopefully I will get as much of use out of them as possible. You can see Eileen Fisher uses several items twice in this feature. Thanks for the interesting comments Sara. Yes many people agree with you on colour, but neutrals work well for me. I now have very quiet low contrast colouring. I look good in neutrals, it’s when I wear strong colours that I disappear ! So I don’t think there’s one rule that’s right for everyone. I think Inside-Out Style comments on colour are helpful for many. Sadly Eileen Fisher are making it impossible for people in the UK to access their US site – we just get defaulted to a few dull photos advertising their new London store. So I’m not commenting on their style this season. It\s interesting that people in France can still get to see what Eileen Fisher are saying. I’m sorry I’m missing what you talk about, as I’m definitely a layering person. There’s more from me on personalising the choices in a later post.